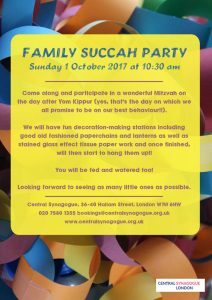 Come along and participate in a wonderful Mitzvah on the day after Yom Kippur (yes, that’s the day on which we all promise to be on our best behaviour!!). We will have fun decoration-making stations including good old fashioned paperchains and lanterns as well as stained glass effect tissue paper work and once finished, will then start to hang them up!! You will be fed and watered too! Looking forward to seeing as many little ones as possible.